As of April 21 2019, 39,127 have tried. Only 447 have succeeded. We reward those who get to finish our FREE online game. Solve any edition and win a special discount for our Living Legends Edition game! CAN YOU BE PART OF AN ELITE GROUP? This edition is designed to be even more frustrating and challenging than the #breakoutonlinechallenge found here. #breakoutonlinechallenge has 3 - 4 "simple puzzles" at a time. If you got frustrated with those, you will love / hate our special edition as it will have 50+ "challenging puzzles." Warning, this might be the cause of sleepless nights. We expect the success rate of this special edition will be much lower than the 5% of our regular edition. This might be one of the hardest games you'll find on the internet. Instead of just having prizes for the top players, we think this is so challenging that we are willing to REWARD ANYONE who can solve all the puzzles. Even if you are the 100th finisher, you will be receiving special prizes. But that is IF you can even finish it. We dare you to prove us wrong. You can work with as many people as you need to help you through the puzzles. You can also join our special group on facebook to find people as dedicated as you in completing this challenge. We request any discussion about our puzzles to remain in this facebook group to avoid spoilers being scattered in different parts of the net. NO DEADLINES. SOLVE AT YOUR OWN PACE AND SPACE. This game will definitely last longer than 45 minutes. You can take as long as you need to try and finish this game. The puzzles will include the objects inside the box but will also take you diving into the online world. As long as you bring all the contents of the box and you have a device with internet access, you are good to go. P500 P249 SALE until May 1 only! ANYONE who can solve all the puzzles (even the 100th finisher) will deserve a prize. But that is IF you can even finish it. Do you think you have what it takes? Congratulations! If you are reading this, you have just solved puzzle 1 of the Jan 20 edition. It only gets harder from here though. Send an email to livinglegends@breakout.com.ph for instructions of puzzle 2 and 3. This is the quickest and easiest way to secure your Breakout Takeout experience. Simply click on the link below and follow the instructions. In this method, you may use your credit cards or a PayPal account to register! Email us at support@breakout.com.ph with the email subject "Breakout Takeout Bank Deposit" and let us know which Edition you want to avail, how many you would like to purchase, and finally your delivery address. We will give you details on how to proceed with this method. 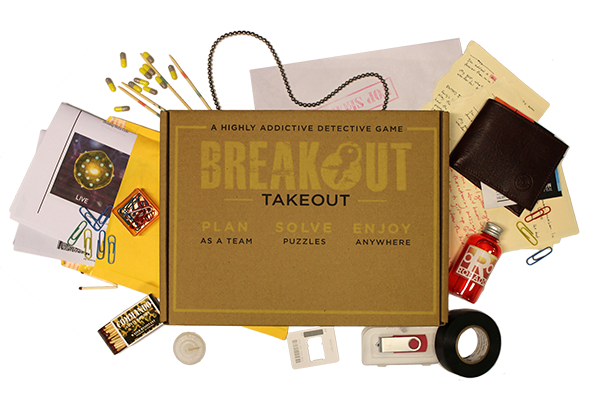 Breakout Takeout is now available for PRE-ORDER across our 6 branches! Simply choose among our packages and our supervisors will assist you in bringing the Breakout Experience home with you! Is it all just online puzzles? Our FREE #breakoutonlinechallenge and Beginner Edition are. The actual Living Legends Edition though will include boxes with curated objects. The puzzle solving process will then include these objects that you solve traditionally, but will also take you diving into the online world. What do you mean the Living Legends Edition is only P1499 if I finish the #breakoutonlinechallenge? The original price is P1999. But we reward those who get to finish our FREE online game. For anyone who solves our current challenge, they will win a P500 discount for our Living Legends Edition game and bring the price down to P1499. Are the puzzles in the Beginners Edition the same as in the Living Legends Edition? Yes, so this makes the Living Legends Edition our premium package--having both online and physical puzzles to challenge you. It also has more special prizes IF you manage to complete the game. How does having only Online Puzzles for the Beginners Edition work? How will I claim the game? Once you confirm your payment through any of the methods mentioned above, we will be sending you your unique link to start your experience. We will be strict about you not sharing this link and if we detect suspicious behavior, can void the prize available at the end of the game. Can you give me a sample puzzle? Get hooked on our FREE #breakoutonlinechallenge and clink on the links above! These are designed to get your feet wet and let you see what you are getting yourself into. I am below 18 years old or I live outside Metro Manila. Can I still join? Yes, of course! For Breakout Takeout, there is no minimum age or location limitation. There is no time limit and no expiration date. You can plan, solve, and enjoy at home or anywhere without worrying about timeframes or deadlines. Is everything needed to finish the puzzle included in the box? Yes and no. No because this experience will have you scanning the internet to uncover additional information and discover more clues. Yes because the contents of the box will lead you to knowing where to look online. Overall, Breakout Takeout boxes are truly portable and may be taken anywhere your heart desires. What happens if I lose or break an item in the puzzle? If you lose or break an item, that’s it! It’s the end of the game and you lose. Just kidding! You can contact us for the item you lost or broke and we can give you a new one, subject to minimal fees for logistics. Yes, you can give it to a friend or family member! Take it out from a branch and wrap it up or, for a minimal fee, enjoy the convenience of having a Breakout Takeout box delivered to your loved one.